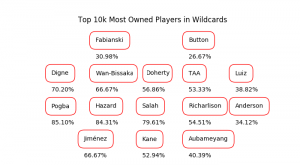 A small portion of the current top 10,000 Fantasy Premier League managers took a leaf out of David Wardale’s book and ‘Wasted their Wildcard’ in the first 20 Gameweeks of the season. Just under 97.08% of those in the top echelon of the game used the chip which was available to them between Gameweek 1 and late December, meaning that just under 3% did not. These were not even inactive players either. I looked at their teams and confirmed that most of them are actually active managers who change their teams every week. It could be the case that they did not know the chip expires before the turning of the year, which seems more likely than them knowing the expiry date and not using the chip even to take a couple of hits for free. The percentage of managers in an overall random sample of 50,000 teams that didn’t use the first Wildcard chip is around 49%. Taking a closer look at those teams, we find that they are mostly inactive, hence the informal name of ‘dead teams’. So, we know there is a minimum of around 45% inactivity in the game at this point. The actual percentage will be bigger since many dead teams may have used their Wildcard early in the season before they stopped playing the game. A future article will look at that question in more detail to quantify the definition of a dead team and calculate how many of them exist. 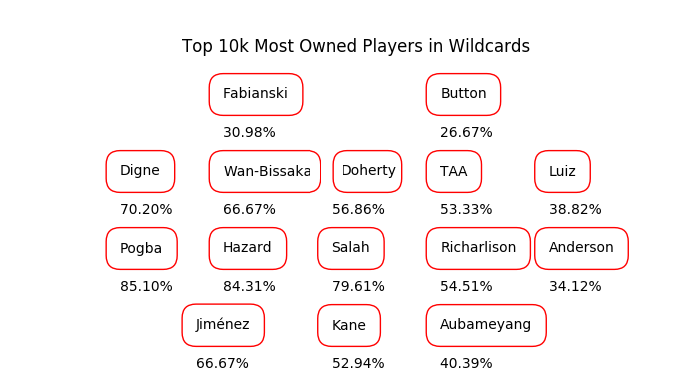 The arrival of the second Wildcard encouraged 2.55% of the top 10,000 managers to use it right away this week. Their most selected players are shown below. It is interesting to note how low those percentages are in the top 10k. In previous seasons, it was the case that many managers who enter the top 10k early are those who utilized their chips earlier and took the advantage over more experienced managers who delay their chips till the blank and double Gameweeks. The percentages in the table above show that most of the managers who are currently enjoying outstanding overall ranks were not particularly helped by the usage of early chips. In fact, no chip has been used by more than 13% of the top 10,000 managers. 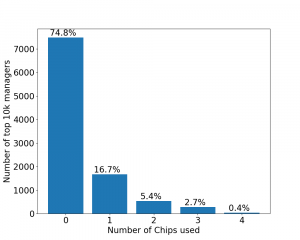 The figure above shows that around 75% of the top 10,000 managers have all of their chips intact. If they hold onto them for around 10 more Gameweeks when the blanks and doubles usually start, then we could see something different this year. As three-quarters of active managers have all the freedom to deploy their chips in any order to cover the double and blank Gameweeks, it might be more challenging to rise up the ranks using late chips strategies like last season. We will keep monitoring chip usage in the top 10k in the following weeks as we’re entering the second half of the season. Keep Rondon for Car at home then shift to Ings.. So after the big game on Thursday..
Would you pick Kun or Auba? No other City attacking player and we all know they'll be on form again soon.. I'd likely keep Auba. Currently without city players myself. Looking at Dilva if I'm to pick one. Also removed alonso and ricky with a plan to buy back cheaper but none of them dropped. 23 from 3 with Patricio balbuena/Robertson Doherty Anderson pogba sane jiminez and Haz cap to go - need a big couple of days! Think you're doing well so far. Bottomed. Which one to sacrifice for Salah? Can I ask why? Both are scoring well but Kane's got better fixtures. Also he's easier to switch to Auba if needed. Underlying stats are unbelievably better, aubas XGI was 35 mins yesterday -do you really want to get rid of someone posting these kind of numbers? Well, on the other hand he had something like 8 touches against Liverpool. Half of them was from kickoff. Along with Son, which other player would you rather lose to release funds for Salah? Tough one. A or B for me. Looks good. I don't think 'too templatey' is a problem. There's a good reason why they are 'in the template'. Current team below. Have 2 FT's and 0.2 ITB. What moves to make? Looking to get rid of Mitro, Anderson (fixtures aren't great), Son (could hold for 1 more week) and also want to switch Auba to Kane when fixtures take a swing. Asked this above. My initial plan was to lose Auba. Sterling + Anderson + Fabianski > Salah + Pereyra + Etheridge (-4) seem like sensible transfers? OMG!! !I finally have a plan. OMG!!!! Let's hear it then! Really wanna squeeze Kane into my team. Is this good or bad? Don't love Moura pick. Otherwise looks ok if it's for -4 and not -8. Missed 4 'big chances'. That's -3 on the BPS for each one. He needed to put one of those away and he'd have had 3 BPs rather than 0. Would like to hear what's your take on Auba or Kane depate? Both. Twist my arm for one only and it would be Aubameyang. I need to drop one to get Salah. Planned to bin Auba but somehow it feels wrong. When is son back from the Asia cup?? Also is there anyone who is thinking of going without Salah?? Auba,Kane,hazard all are performing quite well and getting Salah means to get rid of one of them which seems not very easy for me. I had a look at the groups last night. Theyre going to be in the tourney for a while, very little competition there. Is Son doing football in the Asian Olympics? My mate who is a bit of an idot says he is entered in the 4 x 4 relay and the 100m butterfly. Bottomed last night again..i hated it a first but now i just accept it. Better to hold Kane than bring in Auba instead? Auba is better because he is cheaper and also he is obviously fighting for the golden boot at the end of the season although I am considering selling because I do not want to ever see a premium forward I own get subbed off because of stpd tactical reasons. Those fixtures and consistency, can't make myself sell Kane now. What would be the next move here? 1 ft 0.1 itb. Auba+Snod out for Salah+Kamara? Fairly template move idd, but im considering waiting. West Ham are poor at the back and Brighton are good at home. But being without Salah is risky. Hope the last match doesn't go bonkers for a tiny green arrow.